Susan A. Enfield, JEA 2012 Administrator of the Year and superintendent for Highline Public Schools, Burien, Washington, shares her belief in the educational need for scholastic journalism and student media in schools. Enfield is also a former publications adviser and journalism teacher. 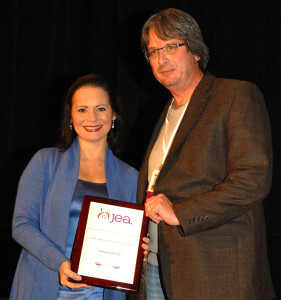 Susan A. Enfield receives the 2012 Administrator of the Year award from Journalism Education Association president Mark Newton, MJE. JEA photo by Bradley Wilson, MJE. The Journalism Education Association chose Dr. Susan A. Enfield, superintendent of schools for Highline Public Schools in Burien, Wash., as its 2012 Administrator of the Year. This award goes to an administrator who has shown a dedication to journalism education.